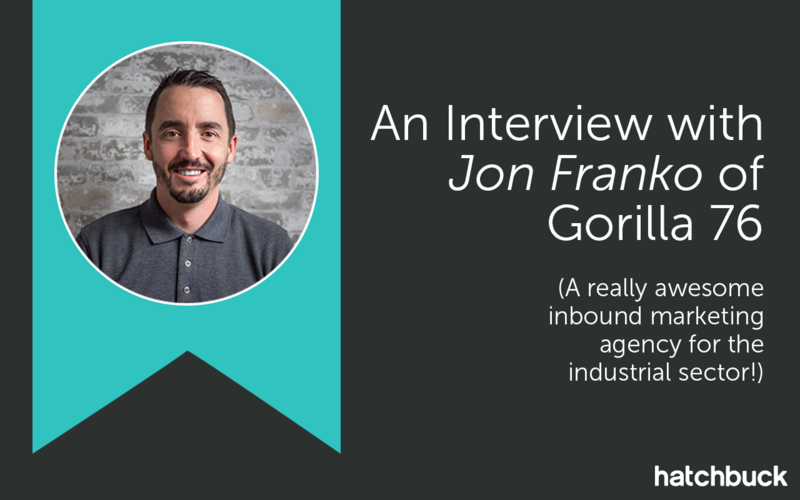 Jon Franko is a founding partner of Gorilla 76, an inbound marketing agency for the industrial sector. Jon has experienced the rise of inbound marketing throughout his career in advertising and took time to share his insights on the value of big data, what marketing strategies work today and where marketing is headed. Gorilla 76 specifically focuses on inbound marketing for the industrial sector. Can you briefly touch on what you mean by inbound marketing, and why it’s important in today’s business climate? Inbound marketing is simply the practice of attracting customers to you versus going out and hunting them down. It’s pull marketing versus push. In today’s B2B environment, buyers are wanting this more and more. We’re all sick of the cold calls and disruptive ads. As potential buyers, we want to do our own research and reach out when we feel the time is right. One of Gorllla 76’s main goals is to attract the right kind of traffic to a company’s website. Can you give an example of what the right kind of traffic might be? What are some methods you might use to attract that audience? The right kind of traffic is the traffic that comes from one of our targeted buyer personas. Buyer personas are simply fictional representations of a company’s buyers. There are often two or three or even more buyers that we want to target with our marketing. That’s the right kind of traffic. We attract those visitors through a variety of methods – blogging, service pages, website updates. But it almost always starts with a deep dive into keyword research. Once you’ve got the audience to the website, Gorilla 76 then nurtures those leads until they become actual clients. What are some different methods of nurturing leads that you have found to be particularly successful? For us, 99% of the time, nurturing is simple – email marketing. With new software and such, there are now opportunities for smart content and the like – which is on our radar, but just hasn’t been a necessity for any of our clients. For those not familiar with smart content, this is the idea of presenting a website experience based on an individual user. This seems to be where the future of marketing is headed. Some of the challenges your clients face include a lack of awareness of their product, wasting time on bad leads, and fighting a really long sales cycle. How can CRM software can help navigate some of these challenges? CRMs are important because they give you a snapshot of your sales funnel, they help you store important information about leads, and they give you lots and lots of data on a prospect any time you need it. We haven’t found them to necessarily shorten the sales cycle, but they do help you navigate. CRMs help you close the loop on leads. Leads are only good if they turn into buyers. So if your marketing is producing a certain amount of leads, you need to know how many of those leads are turning into customers. This tells you if your marketing is an expense or if it’s an investment. This is MUCH easier said than done. Closing the loop has always been a challenge for marketers. Do you use Big Data and predictive analytics at Gorilla 76, and if so, in what capacity? Not really. This just hasn’t been necessary for our clients or for ourselves to date. That said, it’s something we’re always keeping an eye on and reading about. The more we can use data, the smarter our marketing becomes. Likewise, Gorilla 76 specifically markets to B2B businesses. How does this impact the 360-degree view of the potential customer? What are some cues a company could look for, to indicate different levels of interest or identify potential interest or need? Again, we’re not using “big data” to really drive our marketing at this point. But things we do look for in a potential client include page views, time on site, conversions on site and frequency returning to site. Pretty basic stuff – but still very important and very telling for us. In your marketing automation software, you offer a “nurture campaign” option, automatically generating messages for clients that are still on the fence about a purchase. What are some ways that you differentiate these potential clients, and how do you avoid alienating them with your marketing, while still cultivating leads? If your marketing is alienating a buyer, you’re probably focused on selling with your messaging and not helping. If we provide educational, valuable content, and we don’t do it at a rate that’s too frequent, we’ll be good. As for segmentation, it really depends on what content they’re seeking and what information they fill out in a form. Different job titles might put users in different persona buckets which means they ultimately should be receiving different messages in their inboxes. Gorilla 76 offers a variety of marketing strategies for your clients, including content marketing and content strategy. Over the course of your career, how has content marketing and strategizing changed? Is it much more difficult now than it used to be, with so many more sales channels and so much more competition? Or is it easier, with the resources at your disposal and the wider array of opportunities? When I first started working in the ad business, content marketing – at least what I was exposed to – was a paid advertorial in a publication. Now, the brands have the power and have become the publishers. I don’t know if it’s easier or harder. I do know, however, that if you have a strong strategy at the core of your inbound marketing efforts and a competent team to execute it all, you have a great chance of success – no matter the size of your brand. Now, more than ever, the little guys can compete with the big boys. It’s pretty cool. Gorilla 76 focuses on marketing to the industrial sector, which isn’t exactly the flashiest, sparkliest industry out there. What are some ways that you make your marketing more interesting and engaging, while still giving the hard data that business owners need to make a purchase decision? We simply produce good content. While it might not be interesting or flashy to all – it is to the personas we’re targeting and, going back to the question about attracting the right visitors, that’s all that matters.